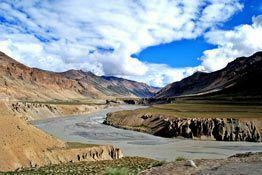 After Tibet, Ladakh has the largest cluster of Buddhist monasteries or gompas, which are the main tourist attractions too. 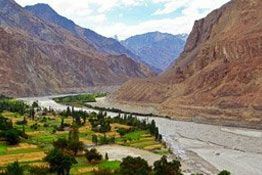 This 14 nights and 15 day cultural tour of Ladakh, is going to give you the chance to visit some of the most known monasteries of the region and thus enlighten yourself. 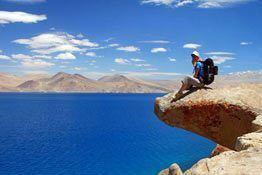 After leisure activities in Leh, your first visit will be Hemis Monastery, the largest and richest monastery of the region. Another major attraction of the tour is the visit to the Castle of Bazgo, built during the 16 Century, which has 2 impressive future Buddha statues. 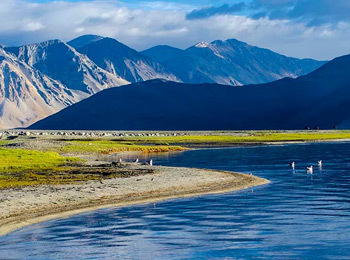 Even today, Ladakh was one of those few places which have not been affected by the Western culture. Early morning transfer to the Domestic Airport to catch a flight to Leh. On arrival, get transferred to the hotel. The rest of the day is free for leisure activities and getting accustomed to the high altitudes (3,505m). 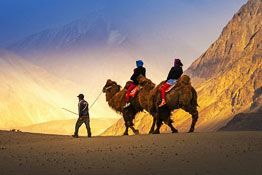 Explore the Leh market. Take a walk to up to Shanti Sputa. Overnight stay. Early morning visit to Hemis monastery, the largest and the richest monastery of Ladakh. It plays host to the Hemis festival held every year. Founded in 1627, tt also houses largest Thangka in the world, made public in every 12 years. 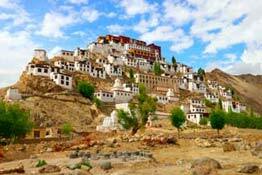 Thiksey monastery is a beautiful monastery above the Manali-Leh highway. Built in traditional Tibetan style, it belongs to the Gelukpa (yellow hat sect) order. 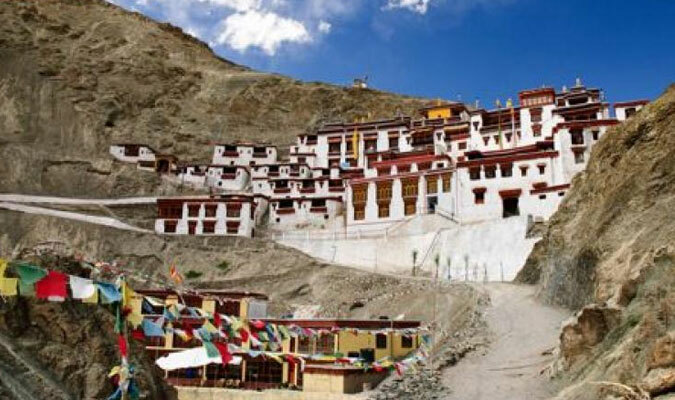 Matho monastery, 500 -year old Sakya school monastery is popular for its 2 auguric oracles. Near to it is Stakna monastery, founded by Lama Chosje Jamyang Palkar. It belongs to the Drukpa order and houses an excellent collection of Thangkas and a small marble Buddha- statue donated by an ancient King of Assam. It has a small museum too. The next visit is Shey Palace, the oldest capital of Ladakh. It contains a 3- story statue of Buddha Shakyamuni. Takthok(rock ceiling) monastery, around 46 kms from Leh, belongs to the Nigma tradition. It is said that the Tantric teacher Padma Sambhava, meditated in the cave. Spituk, located at the end of the Leh airport's runway, it has a total of three shrines. It is one of those monasteries which has been turned into ruins during a landslide. Phyang Gompa belonging to the Red Hat sect has a collection of wall paintings as well as quite a few shrines. It also has an all-enclosed Tantric hall. Enjoy a walk after Sabu Zong, located in Sabu village. Later return to Leh. Visit 11th century Alchi monastery, one of the oldest gompas, founded by Lotsava Rinchen Zangpo. It was built by sculptors and artists from Kashmir as well as Tibet. Likir monastery founded by Lama Duwang Chosje in 1605, belongs to the Gelukpa order. Overnight in guest-house. Kagyupa monastery, Lamayuru is dedicated to Naropa, an Indian Buddhist saint of the 11th century. He had spent many years meditating in the cave that was connected to the prayer hall. A night halt at the guest house. Drive back to Leh, on the way visiting the Rizong monastery, founded by Lama Tsulthim Nima. It belongs to Geluk school. Nearby is a nunnery that has around 20 nuns. Next is a visit to the Castle of Bazgo, built during the 16 Century, has 2 impressive future Buddha statues and some interesting paintings. Overnight stay at the hotel in Leh. 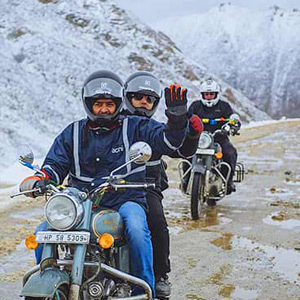 Day 12 is a day that is booked for leisure activities and further exploration of Leh. In the evening, you can do shopping or can watch a cultural show.